On the heels of Mississippi's rejection of an anti-abortion initiative this week, Colorado Right to Life Vice President Leslie Hanks vowed to move forward next year with a "personhood" amendment in Colorado. Similar measures have failed here in 2010 and in 2008. On Christian activist Kevin Swanson's radio broadcast today, Hanks encouraged supporters to attend a "March for Life" rally at the state Capitol in January. "We're going to be launching personhood round 3," said Hanks, who hopes to gather enough signatures to put the measure on the ballot in 2012. Moreover, she said the personhood movement in Colorado is continuing to gain traction and is headed in the right direction. Hanks says she traveled around Mississippi in support of the anti-abortion measure, calling her experiences remarkable even though it failed. "When we do these initiatives we are educating, evangelizing, and we are increasing social tension because people have to say they're either for it or against it," said Hanks. 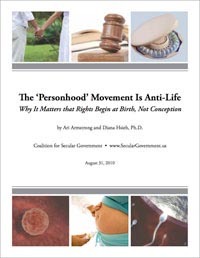 Ari Armstrong and I will be updating our 2010 paper -- The 'Personhood' Movement Is Anti-Life: Why It Matters that Rights Begin at Birth, Not Conception -- for any new personhood amendment in Colorado. Stay tuned.